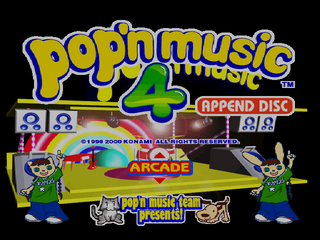 Pop'n Music 4 Append Disc (ポップンミュージック4 アペンドディスク) is the sequel to Pop'n Music 3 Append Disc. It was released for the Sega Dreamcast and is designed to be used with the Pop'n Music Controller. Similar to its predecessor on the Dreamcast, this is not a full game, instead requiring the user to boot Pop'n Music 2 and swap discs to access 4's extra content. Main article: Pop'n Music 4 Append Disc/Magazine articles.